Instapaper has suffered a couple of identity crises in its history, did not end up deciding whether it was a free or a paid service. It was founded in 2008 and what started as a simple web bookmark to save articles and read later, it became one of the most popular applications for iOS. First, it was a payment app on iPhone and iPad, it took six years to get to Android and by the time, it did offer almost nothing that free alternatives like Readability or the ultra popular Pocket, and gave the user without having to pay anything. Soon the app changed to a free model with premium features that were unlocked with a subscription of few dollars per month. Now, less than three months after being bought by Pinterest, Instapaper becomes completely free for all users. 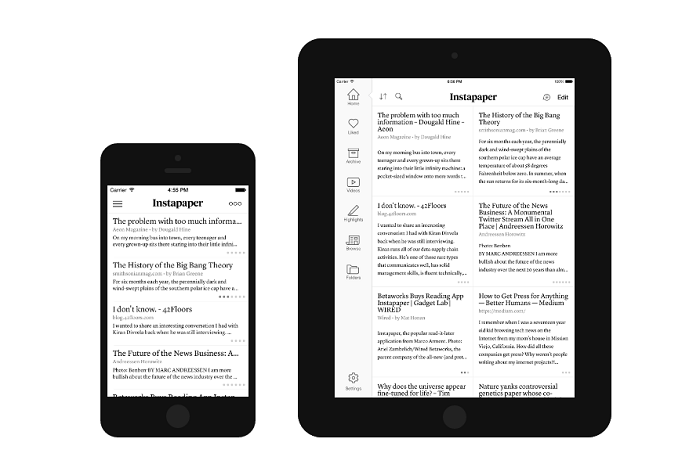 From today, all users of Instapaper will have all the premium features, which are a few. Existing payment users will receive refunds and will no longer be charged for the service. If you want to know exactly what it is all you can do now that everything is free, we’ll tell you in detail. This is perhaps one of the best features of Instapaper, and something that Pocket users do not have yet. Over the free model, the “Speed Reading” mode becomes unlimited . To use it all you have to do is press the button in the form of a timer that appears in the options panel inside any saved item. Fast reading mode lets you read word for word at the speed you choose. By default it displays 350 words per minute, but you can modify it as you see fit. For those who prefer listening to reading, Instapaper has a text to speech function that allows the device to recite the text of the saved items. You can control playback, speed and volume as if it were any audio file you are listening to. Now that all premium features are free, you can also create playlists of items to hear one after another without limits. It is one of the simplest functions and it was limited to only five highlights a month for free users. It seems silly, and it is a little, but highlighted in Instapaper can be very useful, especially for those who have saved many items or want to share special details of any text. In addition to the yellow color that add to the selected text, you can add notes to those highlighted and the list appears highlighted in detail how many of each of the stored. Although before you could do searches on Instapaper, these were a little limited. Now you can search all items you’ve saved in the application, even those who had already filed. You have the option to search in the current section or in all articles regardless of whether or not you have an internet connection. Within the search results, you can manage the articles and move, archive, delete and share them. 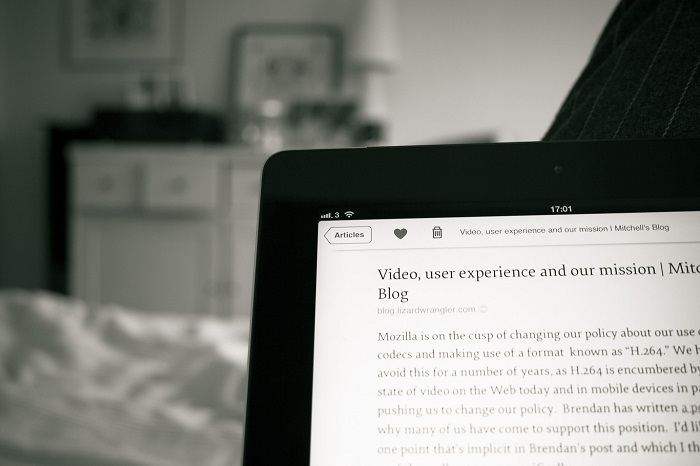 The function of sending the Kindle has always been one of the most popular Instapaper, now with the switch to free mode can send content to your eBook reader either from mobile applications Instapaper, or from the browser bookmark . You can also receive a “Kindle Disgest” with up to 50 articles. Instapaper website now be completely free of advertisements advertising. So you can read your articles from the browser on your desktop without any external annoyance. What else can Instapaper do for me? If now that the service is free you start to consider using it for the first time and you do not know that it can be good that you do not have alternatives, we will review some of its functions. Instapaper organizes your articles in several automatic sections, but you can also create your own folders. In the Home, you have all the posts that you have not read and you can choose to be seen according to the date they were added, according to their popularity or according to their length. The latter really something significant if one day you looking for short readings and other long readings. How many with a section of favorites with all those items that you want to have always on hand because you liked them a lot. And you also have a file that stores everything you’ve ever sent to Instapaper, and now you can search without limits in that huge well. The highlighted section is a fairly unique Instapaper, this will list each segment individually remarcaste text in any article, very useful if you are one of those who love to take notes on what they read. You have a special section for movies in which only they end items with this type of multimedia content, or just videos you saved to watch later. Not everything is reading. Finally, there is the Explore section, where you’ll find featured items recommended by the community of users, publishers or friends. 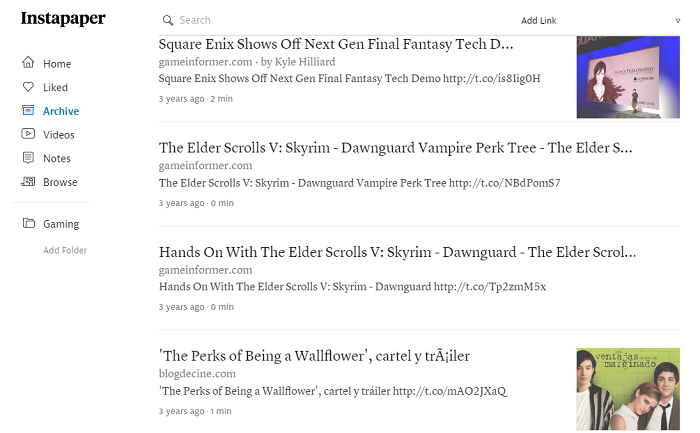 Instapaper lets you connect your Twitter, Facebook, Pinterest, Genuius, Pinboart, Evernote and Tumblr accounts so that you can share directly, in a simple way, both the articles you like and the notes and highlights you make. They have an option for you to receive a weekly newsletter with the most popular stories, so you never run out of something to read. If you wish you can import all your items from Readability or Pocket, or you can generate a list of your items stored in CSV or HTML format to export. Needless to say, Instapaper has always had one of the best user interfaces of this type of applications, extremely clean, minimal and beautiful. With four modes of color and six beautiful types of letters. Maybe it’s time to give it a try again.